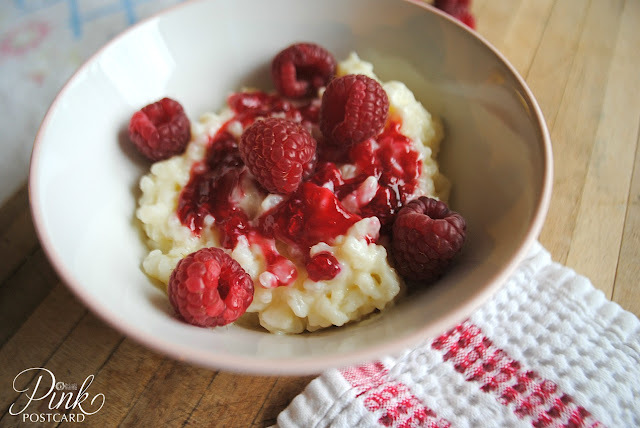 Rice pudding was something I always thought was only for a "mature" generation. And then I went to Pudding on the Rice. Basically, a local, gourmet '31 Flavors' of rice pudding. I had only ever known rice pudding with raisins. And if you're not a fan of raisins (like me) then why bother? It's like thinking the only cookie ever made is oatmeal raisin! Once I tried the rich, custardy, chewy dessert, I was hooked. My favorite at Pudding on the Rice was a raspberry confection. So, a few weeks later I made my own version. Rice pudding is a classic- like mac n' cheese, in dessert form. If you've never tried (or wanted to) give this one a spin. 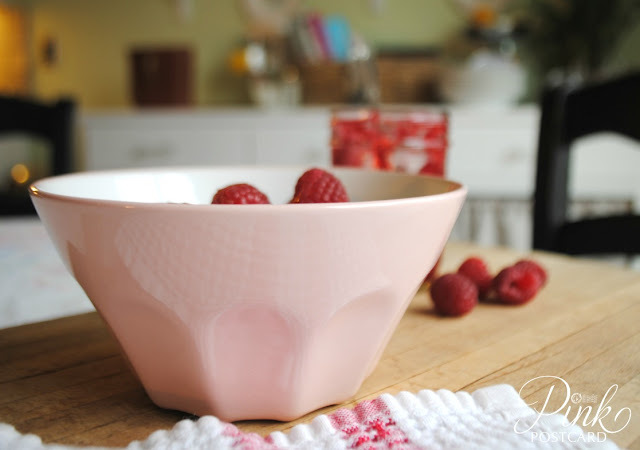 I also wanted to share with you our cute new pink bowls I picked up on our IKEA shopping trip this week. They reminded me of French latte bowls. Go ahead, don't be shy. I hope you enjoy this dessert as much as I do! Add rice, stir. Reduce heat, cover and simmer for 20 minutes. Once rice is done cooking, combine the cooked rice, 1 1/2 cup milk, sugar and salt. Cook over medium heat until thick and creamy, 15-20 minutes. Stir in remaining 1/2 cup milk, and slowly (a little at a time) pour in the beaten egg. Cook 2 minutes more, stirring constantly. You can serve it warm, but I prefer it chilled. Put in the refrigerator for at least an hour before serving. 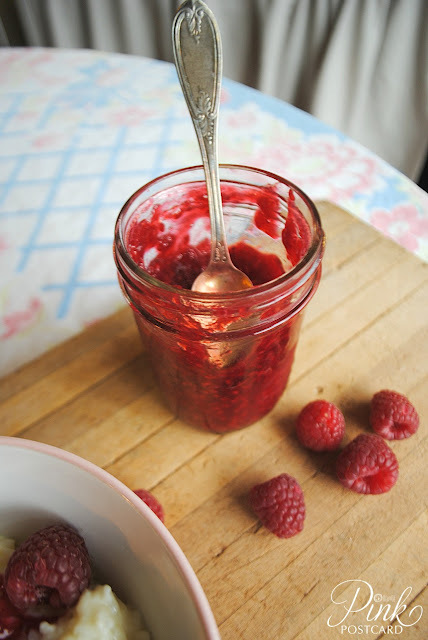 Top with jam and fresh raspberries. 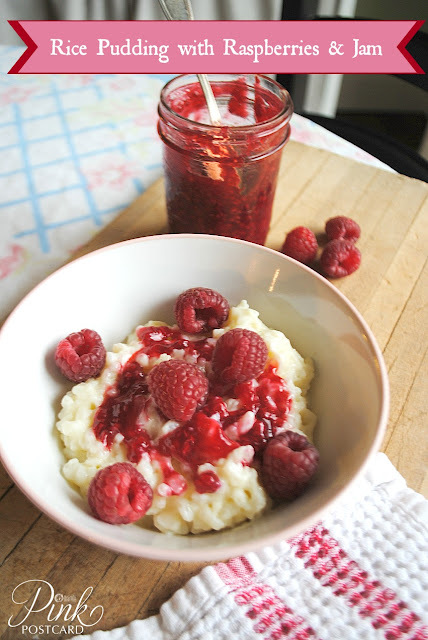 Oh my, I love rice pudding--I will need to try this! That sounds so delicious--I love raspberries! Those pink bowls are so cute--I should've gotten some--I was just there :) Gotta love Ikea! One of my favourite desserts! I never though to put raspberries on it though. Going to have to try that some time! !